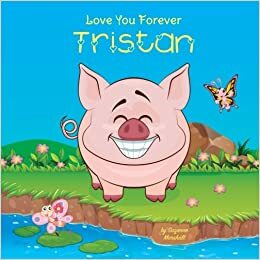 LOVE YOU FOREVER, TRISTAN is a delightful way to say "I love you forever" to any child named TRISTAN. Give TRISTAN a gift of love with this very special, personalized book. Featuring an adorable pig, LOVE YOU FOREVER offers a beautiful message of unconditional love. Throughout the story, the main character experiences many feelings (from sadness to joy), but no matter the mood, love remains strong. LOVE YOU FOREVER includes cute and colorful illustrations as well as fun rhymes for kids. Say "love you forever" to a special child with this personalized children's book. LOVE YOU FOREVER is one of many personalized children's books by Live Well Media.